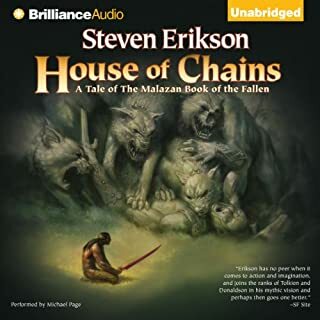 Set in a brilliantly realized world ravaged by dark, uncontrollable magic, this thrilling novel of war, intrigue, and betrayal confirms Steven Erikson as a storyteller of breathtaking skill, imagination, and originality - a new master of epic fantasy. 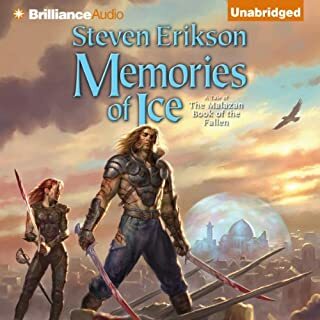 ©2006 Steven Erikson (P)2013 Brilliance Audio, Inc.
Im currently in the middle of book 5 so i cant speak for the series as a whole, but ive loved each installment so far. Deadhouse gates is broken into several subplots with the bulk of the story following duiker, coltaine and the chain of dogs across the continent of seven cities. Subplots also include felisin and heboric's escape from the ottotaral mines, calams journey to assassinate the empress in malaz city, stormy and geslers voyage on the silanda, and apsalar, fiddler and company following the path of hands. Great characters, great setting and great plot. Second book I’ve read by this author. It seems he’s not much for initial character development, but eventually you get them sorted. Great book though. Very imaginative world. After getting through 2 so far I’m very glad he’s written so many ! I look forward to enjoying the rest of them. I also enjoyed the varied and interesting races in the world he’s created. Steven Erickson does it again. (Obviously) If you can stick with it, and keep track of the different, often overlapping story lines, I’m certain you’ll enjoy this incredible read! Make it to the end- you won’t regret it ! Highly recommend this piece of work with all it's twists and turns and ups and more ups. I was very excited to read this book, as I was told it was much easier to follow than Gardens of the Moon; was I ever wrong. I'm no stranger to Fantasy novels and complex series of books, but the sheer overwhelming volume of characters in these books makes it quite challenging to follow narratives in the first place. To make it worse, the author really didn't make any distinguishable story arcs from one band of characters to the next. All are marching along strange terrains, heading to un-mappable cities with baffling names, popping in and out of warrens until you have no idea where they're heading. Wars rage, people die, names keep changing, random gods and "ascendants" just make happenstance appearances, then vanish again. 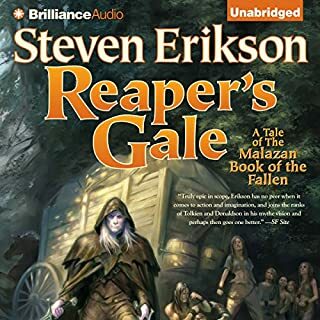 Steven Erikson delivers yet another good story. He has great character development and takes you from disliking a certain character to liking them, then you find yourself disappointed in some of their actions/decisions. I find myself invested in the world/civilizations he has created. I have already started the next book & have purchase the complete series. Well read. 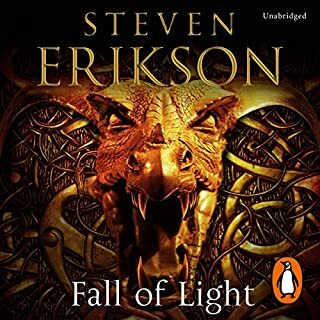 Plot at a high level is great, but Erikson isn't a great writer, imho. His pacing seems way off, and individual conflicts are rendered irrelevant by the frequency of seemingly insurmountable problems faced by the characters and the equal content solutions, often arriving "by Warren" and at the last minute. Not enough light to balance the heavy cruel meandering pointless dark. To reliant on dialogue to advance the plot in a world with ex machina physics. creating a convoluted, confusing storyline that is just a bunch of depressing existentialist genocide scenes repeating until they are meaningless. suprisingly little character development for a book this thick. The characters in this book spend a ton of time walking through the the desert without water. Have a glass of your favorite beverage available as you listen. When I finished Gardens of the Moon, I was at about 50-50 on whether to continue with this series. It was well written, but it didn't pull me in. It was more respect than love. I believed that the world was well drawn, but the scope too sweeping and the characters too numerous to try really get to know any one of them. It gets better. This book continues with some of the characters, but not others. Thus it is a bit more manageable. As you read the series the sheer volume of words over time allows you to get to know the characters more fully. In other words: while huge in scope, it gets easier to grasp as you go along. Erikson is very talented in that his landscape is very well painted. The setting for this series is an entire planet and he seems to want to cover everything that is happening on its surface. Moreover, he has no shortage of ideas when coming up with interpersonal, national, magical conflict. There is always some argument, earthquake, war, or magical existential crisis a chapter away. It makes you wonder how he will keep track of all the threads. One thing I would challenge about the veracity of the characters is their glib misery. Erikson seems to want his characters to suffer most of the time. There are very few iotas of happiness in his books. It's mostly fighting, dying, being raped, descending into madness, suffering, or at least being annoyed. Despite this, his characters really do maintain a fantastically positive attitude. After so much smiling in the face of death, you begin to forget that there is so much of it in sheer volume. It makes me worry for the future of the narrative. If we are simply used to wholesale, abject death, where do you go from there to create tension? That is but a small thing, however. I think I am in it for the long haul. I am on to the third book now and things keep getting better. I recommend carrying on to book 2 if you even kind of liked book 1. Lister does a really good job of voice characterizations even if they are not all the way I would envision the characters. He is consistent and has great cadence. So fill your camelback and drop a credit on book 2. Enjoy. 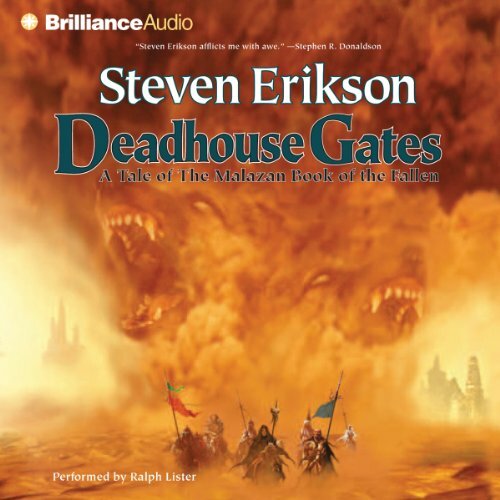 Deadhouse Gates is the second book in the dark military epic fantasy known as the Malazan Tale of the Fallen. Finishing this massive tome feels like you have lived through the war along with the characters. You're exhausted... yet filled with a feeling of accomplishment, and no small sense of awe. The sheer scope of the story that Erikson is weaving is simply MASSIVE beyond anything I've ever read. 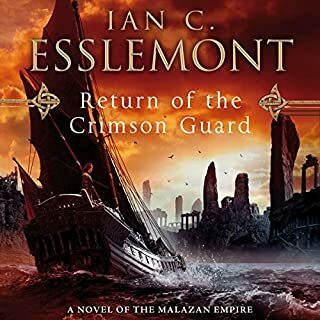 This book is the story of a rebellion breaking out in a land controlled by the Malazan Empire, and the brewing war that ensues. It takes about 300 pages to set up, so until then you'll feel like you did in Gardens of the Moon - "What the heck is going on, and why is _____ happening?" I can see where people say that you need to get to this point before the story really grabs you. That's the nature of this tale, I think. The question is whether you're willing to put this much effort into it, and whether you judge the rewards worth the effort. For me, this was leaps and bounds better than "Gardens of the Moon". The narration was excellent. The voices matched the dark, hard and gritty tone of the novel. If you're interested in reading this series, you need to get some notions out of your head. This is a broad canvas that Erikson is painting. This is a milieu story. It is not so much a character story. Yes, there are good characters, and they grow on you, but if you let yourself invest too much into them, you may get hurt. Every major character will suffer in this book, and some will die. Brutality reigns in this medieval world, and last-minute rescues are so rare that you should never expect them. Innocents suffer. There is some redemption, but I found some scenes hard to stomach. Heroic struggles end in horrid death, and at those times it made me want to scream "WHY DID YOU EVEN WRITE THIS?!" yet it is remarkably well-written. This story is an epic tale of empires. There is a LOT of war in this book, more than any book I've ever read, up there with "A Memory of Light", and that war took 13 books to set up. I can only imagine what's coming in the rest of this series! The main drawbacks I found were in the nature of the storytelling - the high learning curve, and at times, the seeming randomness in which plot-pivotal events occur. It's hard to believe that characters just happens to be on the right road, in the right place at the right time, for his/her destiny to suddenly be unveiled, or to witness some ancient prophecy come to pass. Nevertheless, when viewed among the vastness of this tome, such events don't cripple the story itself. I've got Memories of Ice next, and I'm expecting that to be a turning point. They say you get hooked after that one. I guess we will see! Would you consider the audio edition of Deadhouse Gates to be better than the print version? I'll start by saying that this is easily in my top 3 favorite books that I've ever read (and I've read a lot). It's Erikson in his prime, and I honestly believe that he's one of the great authors of our time, even if his style tends towards the heavy handed and poetic. 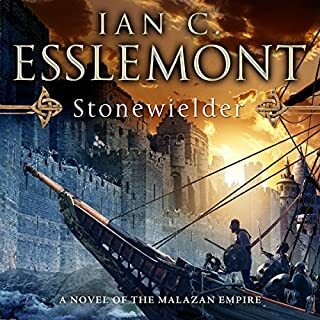 It's one of the few books that actually drew tears at several points, and I can't recommend it highly enough if you enjoy stuff like Game of Thrones, The Wheel of Time, The Way of Kings (Stormlight Chronicles), etc. Caveats: This book is heavy - we're talking George Martin heavy - 20+ POV plotlines are introduced with hundreds of relevant characters. 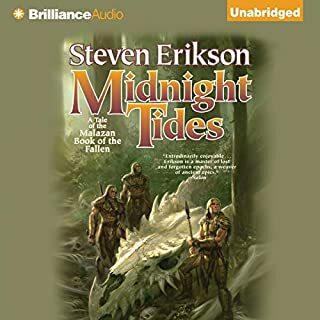 Erikson excels at "epic" world building and this is perhaps the first book where he really lets loose on that front. So be warned - this book takes some level of engagement to follow. It's entirely worth it though... you'll find passages in this book that rival the best literature ever written, even if it's tough to catalog all of the characters, locations, factions, etc. 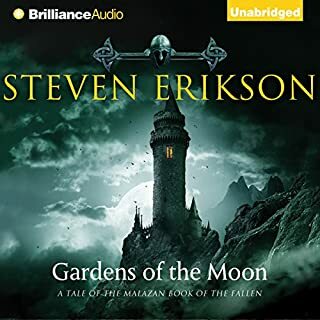 I've also recommended to a number of my friends that they start the "Malazon Book of the Fallen" series with this book, not Gardens of the Moon, since it's riveting and fleshed out in a way taht GOTM never really was. Oh geez. 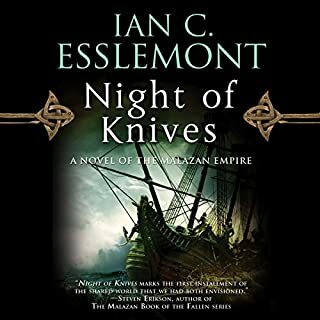 Kruppe & Kalam are my favorites and they aren't really even central characters in this part of the series... Kruppe for his ridiculously entertaining narrative style and Kalam for his badassitude; but there are just so many others that are a close second. I won't ruin the ending... but damn. Did someone cut a whole bag of onions? WTF man. Best ending to a book I've read since Ender's Game. Can't wait for the rest of them! These books really are fantastic! The beginning of Deadhouse Gates might confuse people following the series. 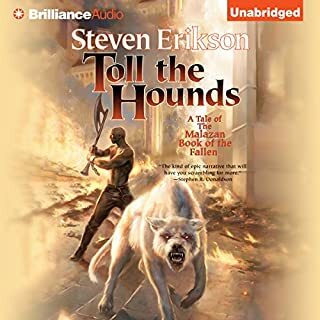 It starts with the Culling in Malazan during the Season of Rot. The story then switches to, among other things, the Rising of the Whirlwind in the Raraku desert, the incarnation of the Sha'ik, the Malaz 7th Army in Seven Cities, and best of all, the meanderings of Icarium and Mappo. There's more Icarium and Mappo banter! Eeeehehee! 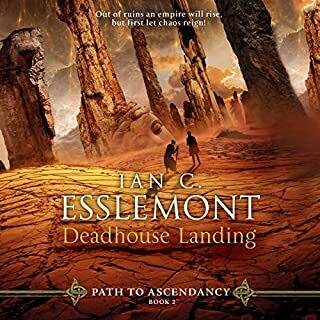 It's an intricate epic fantasy, and although it will be kind of sort of possible to pickup at Deadhouse Gates (Book 2) without reading Gardens of the Moon (Book 1), you will miss some important plot points which will give the storyline more depth. I would not recommend jumping around in this series. To appreciate it, it's really best to stick to the sequence. 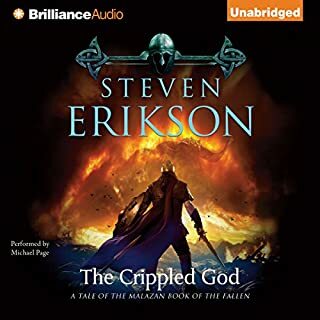 Erikson cross references some of his major plot twists from book to book, sometimes, but if he recapped every small plot progression or significant back story between each book, by Crippled God, we would have to flip to chapter twenty three before we were ready to move on with the story. There really is a lot going on, and it's so inter-woven. 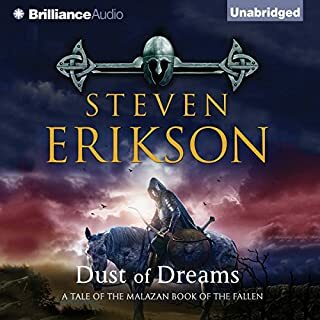 You may not pick up on everything the first listen through, but again, the story gets so crazy, and Erikson's writing style is so incredibly lyrical, it's still a fun read, and worth listening too, again. Listening to the audible version breaks everything down into more easily understandable portions, but don't be intimidated if something zips by you. There's even a Malazan Wiki set up to help. This book really has everything, shape changers, solid battle scenes, sun-dried ears, power struggles, senile old erudites, conflicting cultural taboos, pit quarries, resentful convicts, weird drugs, sea monsters, sand. I can't wait for Midnight Tides! I really hope they keep these coming. Deadhouse gates was much more fun to listen to, thanks to the grounding in the universe lent by Gardens of the Moon. Then characters and plot lines continue right on, and the scope of the series really becomes clear. I loved every second! Ralph Lister's narration was great, it takes some getting used to, the first book was hard to get adjusted to his narration style. But once you do, it's a pleasure to listen to. 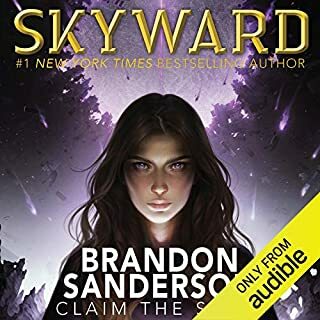 I really hope audible adds the remaining books quickly! The whirlwind Is coming, and we ARE the whirlwind! "This is a stunningly powerful epic that can both capture and entrance you. Words like stirring, captivating, engaging, and memorable come to mind. This wonderful work has rich and complex storylines, characters, and descriptions. Consider the complexity of The Lord Of The Rings. Take it up a few notches, and you might be there when it comes to the Gardens of the Moon. Seriously. And this is only the first in the series!" Well, here's the second book, and it's equally as stirring, captivating, and enjoyable as the first. So, here's the conundrum: How do I review this book without giving anything away? Wow. Okay. Deep breath. Here goes. 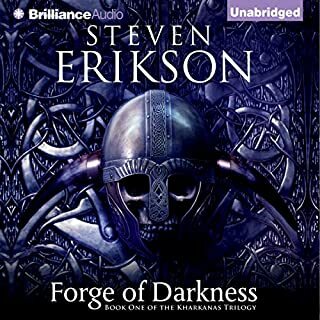 Once again, Erikson crafts a masterpiece that brings a strong storyline, rich character development, dark fantasy, the winds of war, and just plain good story-telling together. 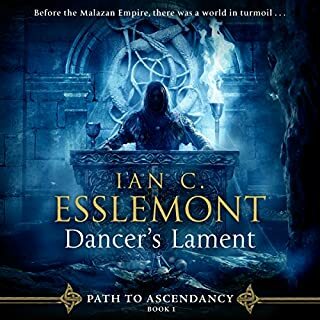 He carries on the story beautifully and rewardingly begun in the first, but it takes place countless leagues away from where Gardens of the Moon began, with only a few of the characters from the first book along for this new ride. Strap in, because a virtual jihad of war is on the horizon, a nightmare whirlwind, and anyone who has read the first book has figured out exactly what I'm being vaguely stating here. Yes, it's coming to pass, and characters you'll love (and hate), most new and a couple of old ones as as well, will be swept into its maelstrom. Deep magics, black plots, and machiavellian twists and betrayals lay in wait for the listener. 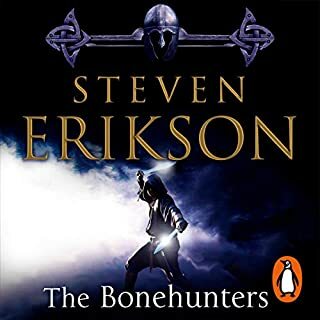 And I HAVE to say, Erikson got me in a few places in this book - I usually play chess in my head with novels, trying to figure out in advance where the arthor is going. And often, I'm right. Erikson, you got me good. REALLY good. You surprised me a number of times. You twisted the plot, and then twisted it yet again . You gave both heroes and villains powerful motivation and direction. The military scenes were dead on. It's...well...gripping. And GREAT listening. Keep in mind that the sheer size of this sweeping epic requires time to set up the pawns, knights, bishops and king and queen on the gameboard, but once done, the story propels you forward. it takes you on a journey that still has eight more books to complete. But again, it is NOT for the casual listener. In fact, it's more demanding than the first audiobook. Is that even possible? Yes, it definitely is. Is it worth the effort? It is, in a word, exceptional. I wanted to like this book and the one before it so much. It has a great story-concept, as rich and deep as Song of Ice and Fire any day. Sadly though I find that this book takes more effort than I can sustainably exert to follow its twists and turns. Am I falling into dementia? Perhaps. Thankfully though I can enjoy the likes of Sanderson, Rothfuss and Martin. I've tried to determine the problem and I think it comes down to attention as I've said. I like to listen to books while driving and hiking, exerting continuous partial attention and still enjoying the experience. Sadly this series of books is opaque to me. It would be hard to top Gardens of the Moon and this doesn't quite do it, but it is still a superb fantasy read. There is a good mix of new characters and returning characters. The return of Bridgeburners Fiddler and Kalam make the start of the story more enjoyable as there is some continuity between the first and second books. Mappo and Icarium are great new characters and their story throughout the book is an amazing trail of discovery. Once again, the world that Erikson creates is immense and it is unfathomable how Erikson makes it all come together. As with the first book, Lister's narration makes the story feel that much more believable. 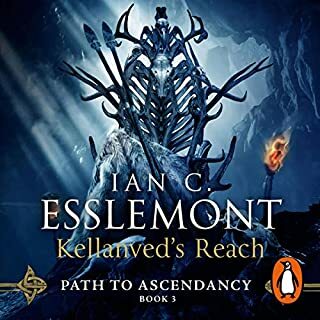 I am very happy to see that Brilliance Audio will be releasing books 4 - 10 on audio periodically over the next two years. I hope there is no delay in Audible making them available. When I started this series I did not realize it was not complete and I hate to wait years between books. What made the experience of listening to Deadhouse Gates the most enjoyable? What other book might you compare Deadhouse Gates to and why? brent weeks shadow assassin series. The details and settings are deep in detail often overly vivid i detail. great reader sets the mood well. I can't say too much that's negative, it's just all good! Characters are memorable and you invest yourself in their stories. The plot seems pretty solid, although I have no idea where it's going, yet. The writing is quite good and at times you feel the language elevate you to more emotion than you probably want while sitting in an office, listening to a book. And its scale is epic. A nice, long listen. Download it. Download it now!